Adding lovely benches to the small park area beside the Pettes Library is such a good idea it's a wonder it hadn't been done sooner! There had been some available public seating there before but it was never enough and you could often see visitors looking about for a nice place to sit under a tree and have a wee rest. The new benches have loveley cobbelstone walkways leading to them and really make ideal use of the green space. The landscaping was spruced up and now the shade of the handsome trees can really be enjoyed. They are in the perfect spot with all the shops and boutiques nearby they will surely become a popular meeting and resting area for visitors. Public seating is hard to find in almost any small town and it is much welcomed to see some good quality benches being installed instead of something of lower quality. It will also be nice not to be forced to go onto a terrasse of a restaurant or pub for a "sit-down" since most outdoor seating decks are now filled with smokers. 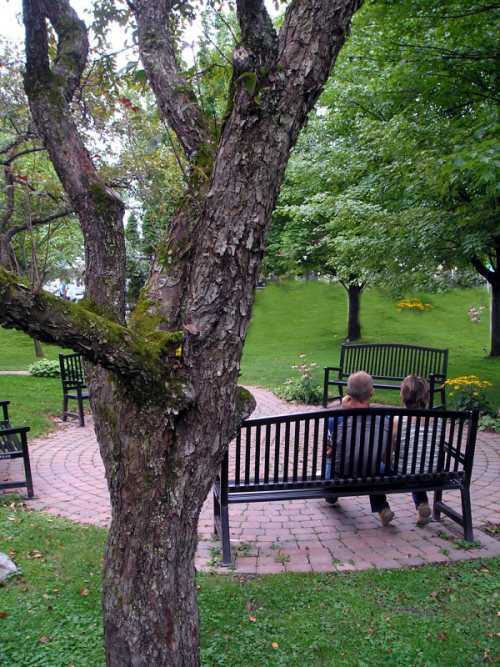 Benches in the center of Lac Brome is a great move and a very positive initiative for the future of Lac Brome! Bravo! Knowlton Gas Station Says Buh-Bye! SPCA Adoptions Raise the "Woof"
Quaint Village or Monster Truck Show?